Is today a good day to go fishing? On this vlog episode I’m pondering if it’s worth to go to the river just for few hours after a long day at work and without good gearing-up and preparation. And if you are the kind of person who loves fishing, be sure to get the free surprise I have for you. If you want to make sure the fishing conditions are perfect before you put on the waders and grab your fly rod, there’s a lot of things to consider. You can be very strict and try to figure out the perfect conditions. Consider water temperatures and alignment of the moon and all sorts of things. To make sure if it’s a good time to go fishing. You can do like me and go fishing always when there is a chance. Despite the probability and likelihood of actually catching a fish. Because if you’re anything like me, you relate other values to fishing than just catching a fish. Like for example spending time outdoors, enjoying the nature and beautiful scenery. And just relaxing. If so, here is my suggestion for you. Go fishing always when you have a chance! And in case you feel like you don’t have enough fishing opportunities here are few tips for you. This is what I love to do. When I have some sort of trip coming up, I’m always thinking is there a chance to go fishing. That has got me fly fishing in Japan, South-Africa and Bahamas, for example. And of course that applies for travelling in your home country as well. Is today a good day to go fishing? Often you hear people saying the waters are too high or low, too cold or too warm, it’s too windy, the good hatches are already gone , or it’s too early season for good fishing, or it’s too late now, or whatever else. All very professional sounding reasons. But my point is that don’t wait for the conditions to be perfect. And sometimes when it’s so NOT likely, you catch an awesome fish. Or vice versa. Use social media to connect with local fishermen and ask for coordinates. Especially if you are going to a different country or place you haven’t been before. You might not get the super good – secret spots. But the main point is to get a taste of fishing in a new place. If you still feel like you don’t have enough chances to go fishing read my mini e-book on how to go fishing more often. It’s free to download. And there’s one killer coordinate tip for you. Now it’s time for this vlog episode, where I practice what I preach. 10k Fly Fishing Experiment continues. Episode 028 of 10K Fly Fishing Experiment. Hours 279 to 280 out of 10000. 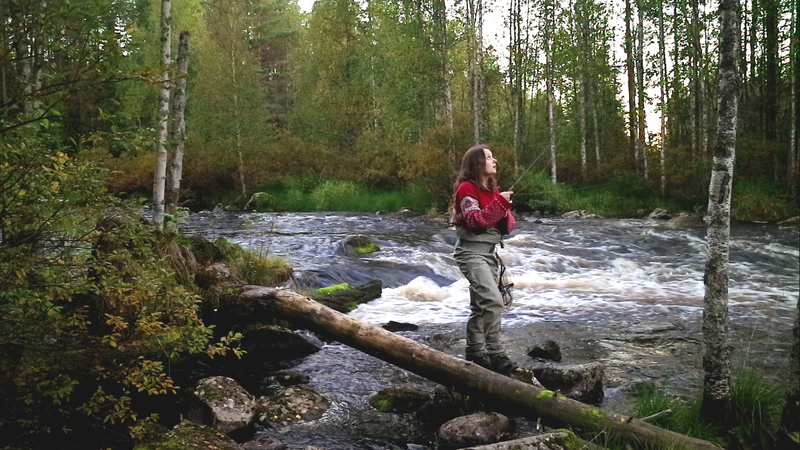 Flyfishing in Luvankoski River in Hyrynsalmi, Kainuu Region. Fishing in Finland. Fishing is the greatest activity as you can combine fun, action and suspense. 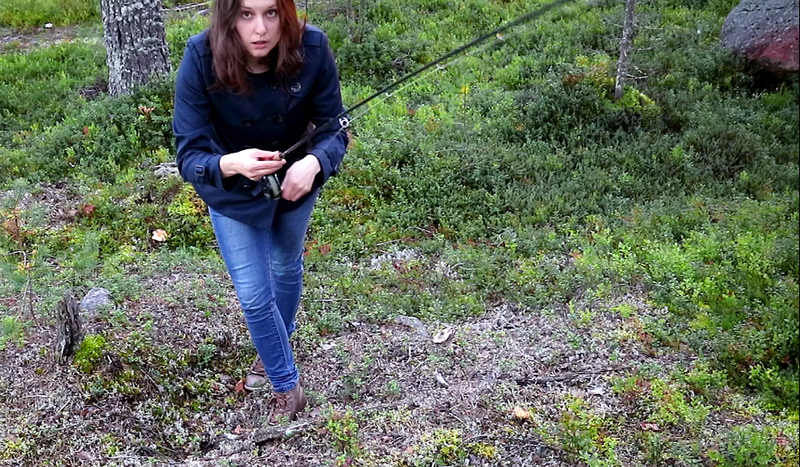 Anni knows that you can combine fishing with many activities. After a long day at work it is the best way to relax! There is no «ideal» fishing day. Sometimes you have the best bait, the day is perfect, excellent fishing tackle but you do not get a bite! The article and video are helpful. Furthermore, we would like to add some tips. 1)	It would be helpful (trust me) to have a small rod, line, hook and lure in your car just in case you want to fish if you are close to a lake or river. A handy fishing tackle «kit» is always useful! 2)	If you are planning to visit a place, you can choose a route which is closer to a fishing spot. Grab your tent, fishing tackle and some snacks and hit the road! 3)	Instead of fishing alone you can grab a friend and organize a nice fishing trip. The ebook is also really helpful and you can find thousands of creative ideas!